WTF President Chungwon Choue (left) poses with new IOC President Thomas Bach (center) of Germany and WTF Secretary General Jean-Marie Ayer. 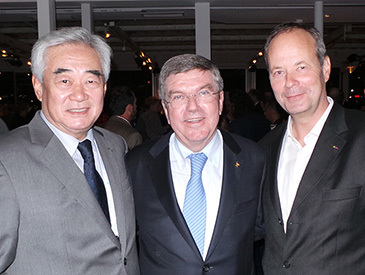 WTF President Chungwon Choue met with new IOC President Thomas Bach of Germany and WTF Secretary General Jean-Marie Ayer at a dinner reception at the Yacht Club Puerto Madero in Buenos Aires, Argentina on Sept. 10, 2013. The IOC elected Bach as the ninth IOC president at its Session on the same day. He received big applause from IOC members after after being elected head of the IOC at the Hilton Hotel in Buenos Aires, Argentina on Sept. 10, 2013. Outgoing IOC President Jacques Rogge made an official announcement that Germany’s Thomas Bach was elected new president of the IOC. Bach conferred an order of merit on the outgoing IOC President Jacques Rogge during the IOC session.